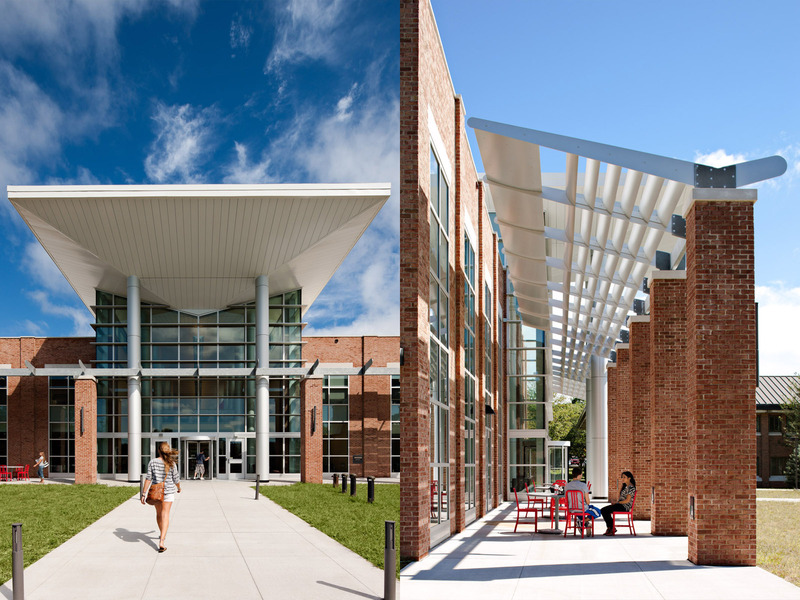 With a campus dominated by 1960s brick structures with punched windows, design objectives for the MLRC included creating a campus focal point, establishing the north edge of what had been an unfinished quadrangle and establishing areas for future development. The campus had constraints including a protected pine barrens to the north and an underground utilities system running through the center of campus. The building design and location created a cohesive new identity for the campus: contextual without being derivative and a clear aesthetic direction for future campus expansions. Serving a non-traditional student population, the MLRC is geared to meet the needs of all learners with variety of spaces: conventional study tables and carrels, study rooms to accommodate groups of students, lounge seating with tablet arms and booth seating for informal study groups. The MLRC has gone further with the addition of unique learning settings for Information Literacy, Distance Learning, Academic Skills and ESL. Classrooms have peripheral computer stations for independent work, a video projection system and center tables where the students gather for lectures. Repositionable furniture and fixtures maximize flexibility.